NextSarah Blasko – ‘Depth of Field’ album review. It’s probably safe to say Turkey’s culture has its roots in Istanbul. And if you’re looking for world music to listen to and some of the most incredible and eclectic rich sounds imaginable, don’t look any further than Light in Babylon. This is a music group whose origins were made on the streets of Istanbul. 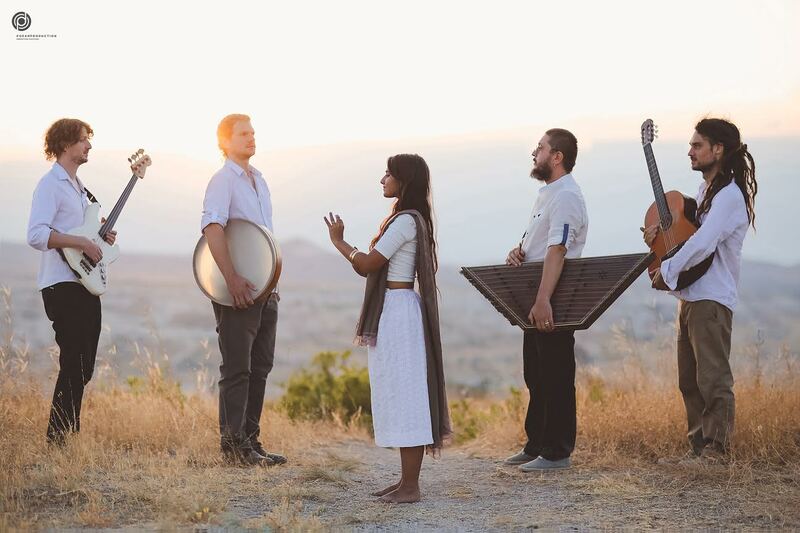 Singer and lyricist Michal Elia Kamal, Metehan Cifici on the santour, and guitarist julien Demarque make up the core of Light in Babylon, who met in Istanbul in 2010. They toiled away in one of Istanbul’s most popular districts honing their craft and establishing their unique multicultural sound. By 2013, they recorded their first album Life Sometimes Doesn’t Give You Space and followed it up with their sophomore release Yeni Dunya in 2016. Importantly throughout this whole period, modest success followed and today the band along with the support of percussionist Stuart Dickson and bassist Jack Butler, tour across Europe, bringing smiles to the faces of new audiences everywhere. Recently, I had the pleasure to contact Light in Babylon’s spiritual leader, Michal Elia Kamel. Her story alone is fascinating, an Israeli from Iranian origin, with a wonderful positive outlook on life. But while one day I would dearly love to talk to Michal about her interesting life, for now I am very much interested by her creative musical adventure. Here is some of what we talked about. I read that you were once described as ‘ambassadors of peace’. How do compliments like that sit with you? To be called ‘ambassadors of peace’ it is indeed a big compliment for us, I believe it is even describing one of the reason we do music and the way we observe people and the world. We have fans from all kind of countries, from different religious and cultures, many time people are asking us, how is it even possible..? But for us it is very clear, we always call our music , world music , we see our-self as the people of the world , and our message is that before all nationally, culture , religion, language. We are all first of all humans, when we will remember that we will remember to respect each other. Your first stage as, described by you, was the street, busking to the eclectic masses of Istanbul. It’s quite an apprenticeship to have started with. What do you recall most about those early days? Do you have any fond memories? We performed in Istiklal street in our first years as a band, I must say that Istiklal street is not just a street, not like any street but a very special place. In that time (2012) it was a place where people who passed by there where searching for something. Something to happen, some music or art. It was a place of diversity, different people, different cultures, religion, and opinions, all passing there and listening to our music and feeling something. The reaction of the people was amazing, they wanted to get close, they cry, or smile, or dance. To put something like our music in the middle of someone day, just like that, live with no boundaries, create a strong impact and touch deeply the listeners, but not only them, also us, we learn a lot from it, how to understand people, how to respect people, and how to be modest and humble, now that we become more famous and we play in all kind of big stages. We still remember what we learned from our time in Istiklal street. Do you still love playing for passersby in Istanbul? Of course we do not play anymore in Istiklal (or any) street, we did it for some time and it gave us so much but since then we moved forward to the next step. Just passing by Istiklal street today takes lots of attention from peoples who ask photos (which we always happy to meet). Having a performance there will be a mess and also in general many things changes in this place since our time performing there, we were hoping to inspire new young group to continue this culture and go out there and share their music. What is the mood like when you play at International festivals across Europe? Are people still quite welcoming? Yes! We must say that we feel ourselves very lucky to have such an amazing people listening to our music. After each of our concert we always give time and invite the audience to meet us for some photos, signatures and cd’s and it gives us the time to see our audience in the eyes, even if it is crowded and takes long time , we always stay till the last person because for me it is the best part of the concert. It gives me lots of hope to meet so many people with open heart and open mind, people who still believe in people and have hope and spark in the eyes like me. It doesn’t matter if it in Europe or in other place, people who listen to our music always react the same and the warm part of them comes out. What is it about your music that people find so infectious? We believe that music is not only entertainment, not only for pass the time, music has a meaning and impact on our life. Light in Babylon brings not only music but also emotion, in a world where peoples need more and more to hide their emotion, where television become more cynical and the pop music more artificial. People are hungry for something real, they want not only to hear music but also to feel it! The music we make say something, there is something honest in it, full of hope. Listening to your music has made me realise how much I have come to appreciate music from around the world. What I’d like to know Michal is who influenced you and why did you choose to make your ‘brand’ of music? Many things influenced me, not necessary one specific type of music but a mix of music, cultures and ideas. I grow up in a home that women power is something very important and I think you can feel this in my way of singing and voice. I come from a Persian home (both of my parent were born and grow up in Iran) so the culture and the music from home affected me as well. Our band was formed in Istanbul, Istanbul is a very special place for us, and always will be, it is a city with a lot of intense feelings, there is something old with something new, some sadness with a beauty within, some joy with energy and people and lots of movement, in a way, we can describe our music like we just described Istanbul. You once said that although your band is made up of different members from different regions, who all speak different languages, the thing that unites you all is your shared existence and love of music. That’s quite beautiful and poetic. What else can we all learn about music and its universal appeal? Yes, music can do many thing and can connect many people but I believe that music carries within some energy and it is very important where the music come from, for what purpose. When you open the radio and hear a commercial there is also music in the commercial, it can be very nice music, but the purpose of that one is to manipulate you to buy something. When we all met each other in the band, music connected us all but for this to be happening we had to have something clean inside, something naïve, we needed to want to be connected and to communicate. Only because of it we could create something like our music that will help others connect and feel too. Your music covers a range of issues, which include love, loss, life and death, and in some sense existential themes. The world we live in today has undoubtedly shaped who you are. Is that a fair assessment? Yes, our music reflect the way we see the world and the way we change with the world according to the places and the people we meet, and according to the thing that happened in our lives and our dreams. We always say we are a dreamers ( we even did our own version for the song “Imagine” of John Lennon) , in our music there are many messages but we are not telling people what to do or how to live but we are sharing our own story and dreams and we let them to travel among many people far beyond us. For example, I am Israeli, I write my songs mostly in Hebrew. I have an Israeli passport so there are many countries I am not allowed to enter (Tunisia, Bangladesh, Iran, Lebanon, Syria, Malesia, Saudi Arabia and more.) my physical body cannot be there, but my voice… my voice fly far away to every place, people listening to our music and writing me from many country I cannot visit, writing me how much power it gave them, that our music helped them to come through difficult time, or helped them to understand many things. Music can travel, music has no borders. I’d imagine your working relationship with Metehan and Julien is incredibly rewarding. Can you tell me something surprising about your strong bond? To have your music in a way it is like to have a child, and the people you make music with are the people who are raising with you this child so they must be like your family. I, Julien and Mete started this band we know today as Light in Babylon and on our way, joined us Jack Bulter the bassist and Stuart Dickson the percussionist. We all lived and met in Beyoglu district in Istanbul, around the area of Taksim square and Istiklal Avenue, we all know thus places very well to its music scene, it was our main “playground”. In a way I feel that these guys can understand me, I feel like they are the guys from my neighborhood. Honestly I can say that each and every one of them is a great man. Some men feeling threaten by powerful women or it is hard for them to contain this kind of energy in music but I am feeling very lucky to make music with not only very good musicians but also very good and supportive humans. I’d love to end on a final note and talk about your amazing song ‘Kipur’ and that incredible video shot in Cappadocia. Firstly, I’d like to say Cappadocia to me is quite a spiritual place. My interest in it stems from not only its geographical beauty but with the people that lived in its rocky outcrops and caves throughout history. Michal, can you tell me how you came to shot the video in Cappadocia? And what can you tell me about Kipur and its message? I had the idea to have the video clip for “Kipur” song in Cappadocia already few years in my mind, I was waiting for the right moment and the right opportunity. Kipur is a very special and spiritual song. The lyrics are from a poem by Solomon Ibn Gabirol, a philosopher from the 11th century, Spain. The poem is about freedom, spiritual freedom, the ability to understand the nothing and the everything in the universe and within. Cappadocia gives me this feeling, special feeling of something free, but something very settled like those big pointy rocks. Light in Babylon’s album’s Yeni Dunya and Life Sometimes Doesn’t Give You Space are both available via cdbaby and iTunes. You can connect with Light in Babylon via their Facebook page or twitter feed @LightinBabylon. You can also visit or contact with Light in Babylon via their website. Follow them on Instagram. Watch them on You Tube. Photo credits: All images used are copyright and courtesy of Light in Babylon. It cannot be used without their expressed permission. I am not the uploader of You Tube clips embedded here. What a great interview. Really good questions too. I’ve never heard of this act, but – not for the first time – Rearviewmirror is putting things on my radar. Really interesting backstory too and some poignant comments. And Cappadocia – what a place to film. Another fantastic interview Robert. You always ask such thoughtful questions that manage to get your subjects to really open up. Their music is mesmerizing. Thank you. Michal is such a beautiful soul. It was an absolute pleasure connecting with her. Sarah Blasko – ‘Depth of Field’ album review. Interview: Glenn Richards talks about Augie March’s new album Bootikins and their upcoming tour.